Congratulations to our U18 side who were crowned Surrey FA County Cup Winners with a 4-1 victory over Epsom & Ewell Colts at Meadowbank, the home of Dorking Wanderers FC last Friday evening. Whyteleafe took the lead early through a Ryan Penton goal which was coolly finished to put Whyteleafe 1-0 up. Epsom & Ewell replied from the penalty spot to make it 1-1. Whyteleafe regained the lead through a Bradley Williams penalty to put Leafe 2-1 up at half time. 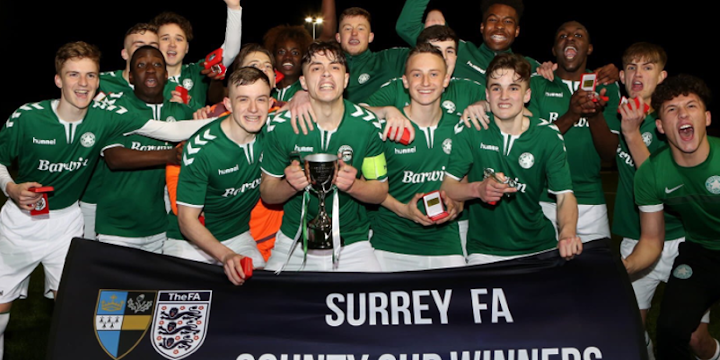 In the second half there were a number of changes made and Whyteleafe completely took control adding a third through Kajubi Kalanzi and Ryan Penton wrapping up the proceedings helping himself to his second and Whyteleafe’s fourth to secure the Surrey FA County Cup. Congratulations to all of the U18 players, management and coaching staff. A great achievement. Well Done Boys.